"Joe, you can have your home back tomorrow," said Sandra St. Victor at her CD release. Make no mistake, for one night Joe's Pub became "San's Pub". 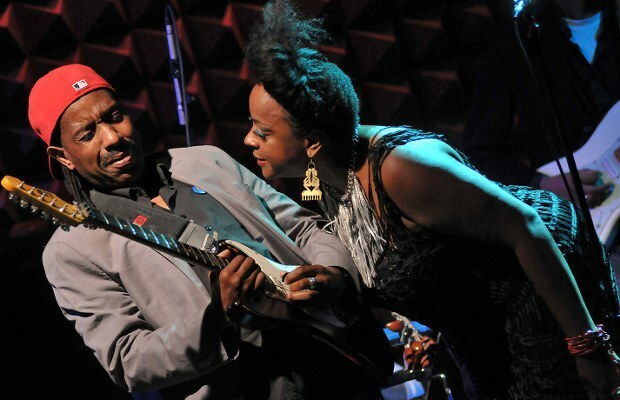 Sandra St. Victor made her long-awaited return to Joe's Pub on a recent September evening joined by royalty. Currently based in the Netherlands, the funk-rock queen's concerts were once an annual ritual at the Public Theater's celebrated nightclub. This time, however, the spirit of Oya blessed the proceedings. Poet Faybiene Miranda introduced the show while St. Victor's six-piece band stirred up an atmosphere of anticipation. In a bracing spoken-word piece, Miranda praised Oya, the Yoruba deity and Goddess of storms and winds. "Her energy is transformative, bringing change into our lives whether we are ready for it or not. She is relentless in pursuit of truth." Miranda proclaimed from the stage. Oya is also the title subject of St. Victor's first full-length album since 2001. Honoring the release of Oya's Daughter (2013), St. Victor wove some of Oya's powers through a 70-minute set that largely drew from her latest batch of compositions. 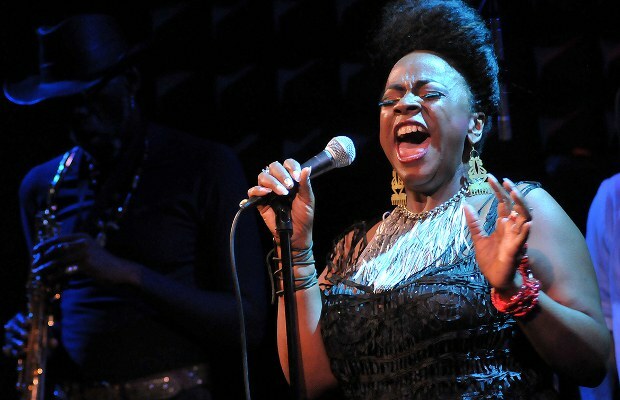 If her appearance at Joe's Pub was any indication, Sandra St. Victor is clearly in top form with Oya's Daughter. Following Miranda's introduction, St. Victor's entrance sparked a surge of applause. Accompanied by three background vocalists, the singer launched into "Fate's Laugh", dropping wisdom in couplets like "Life's crystal stair ain't clear / a bastardized cliché / Go on and waste my ear / with what ain't yours to say." She unveiled some of her patented scale-defying vocal pyrotechnics over a sumptuously funky beat. Mirroring the album sequence, she segued from "Fate's Laugh" into "Grateful". 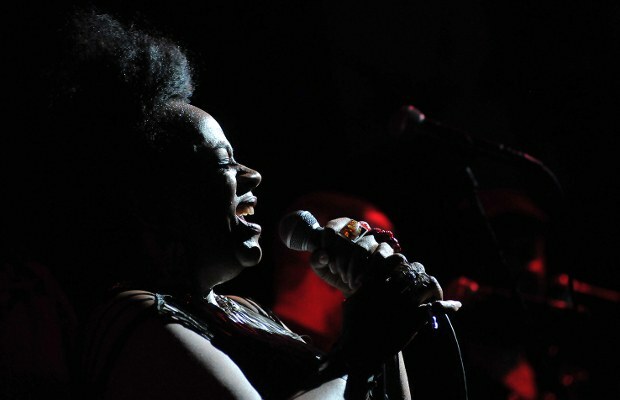 Translated live, "Grateful" retained its place as the most contagious of Sandra St. Victor's new grooves. Drummer Abe Fogle deftly navigated the song's tricky start-stop rhythm, even sneaking some extra fills into the groove. "Joe's is really like a home for me," the singer said after the last few thrilling seconds of "Grateful". "We used to rock this place at least once a year. It was 'San's Pub' for one night." An audience member shouted, "You look beautiful!" after St. Victor disrobed her long diaphanous jacket to bask in the stage lights. The kind of love flowing from the audience was missing in the storyline to "Presence", a song that explores the dynamic of one lover taking the other for granted. "He's at home," St. Victor said in her prelude. "You see him. The mofo's right there! But is he here? He's not present." As is her wont, she sprinkled a dash of humor over the heartache. St. Victor had an unforgettable one-two punch in store with the next pair of songs. Dancing a Latin side-step on "What Have We Learned, Pt. I", she let the rhythm permeate her body while slipping into a vastly different emotional space. Her expressive arm movements accentuated the lyrics: "Born to fight, born to breed / Weeping bodies trained to bleed / Round and round we're circling / What we've learned no mystery / What have we learned … nothing." Without skipping a beat, "What Have We Learned" quickly morphed into its companion "WTF Opus Part II". While St. Victor rendered the lyrics in her own unique idiom, the band filtered funk and gospel through pyrotechnic rock. Guitar legend Ronny Drayton made a surprise appearance midway through song. His solo captured the perils of injustice and put a blazing exclamation point on the letters "WTF". It was a raging firestorm of music that Oya herself might have ordered "to usher wrongs into their graveyard" (to quote the poet Faybiene Miranda). Sandra St. Victor next summoned romantic tones on "Eternal", a testament to how love between two people can thrive even beyond the physical world. "We live in inner space, existing everyplace / Until we can embrace, will you wait for me in the eternal?" Background vocalist Damien Nova echoed St. Victor on the word ‘eternal,’ like the voice of a long lost love. Soloing on soprano sax, multi-instrumentalist V. Jeffrey Smith embellished the song's bittersweet subtext. Smith and St. Victor duetted on a few improvised phrases towards the end, a special moment shared by the two longtime friends and co-founders of the Family Stand. "Some songs just do it to you." said the singer wistfully. Taking a detour from Oya's Daughter for the next two songs, St. Victor reached back to her own catalog and the catalog of one of rock and soul's most influential groups. St. Victor’s band rocked Joe's Pub off the ground with "F.M.A.O.-ocity", a standout track from the At My Spheres (2010) EP. As a studio recording it slays but was utterly explosive in concert, incorporating "Auld Lang Syne" into jagged funk-rock and twisting words ("that turn-of-phraseology") into different shapes. After spelling out the title "For Mature Audiences Only", the singer quipped "I'm attempting to go over my own head." She then saluted the king of clever wordplay with an incendiary version of Sly & the Family Stone's "Underdog". Damien Nova, Keith Fluitt, and Darius Booker lent a mighty response ("yeah, yeah!") to St. Victor's call, one of many instances highlighting the trio's seamless blend. Continuing to showcase Oya's Daughter with "Stuff Momma Used to Say" St. Victor explained the inspiration behind the tribute to her deceased mother. "I wrote this song so my daughters could have a flavor of her. She'd serve us turkey wings in china bowls. I wrote down all the things my mom told me that stuck." Musically, the number was no solemn homage but a funk-infused celebration of life cut along a hypnotizing groove. During the closing vamp, St. Victor took a moment to introduce each of the musicians. Led by Musical Director and keyboardist Tom Hammer, the band was rounded out by bassist Leslie Lemon, guitarist Marcus Machado, and Daniel Sadownick, who closed the set with one of the most masterful displays of percussion Joe's Pub has likely ever seen. Greeted by a standing ovation, Sandra St. Victor returned for an encore and granted a fan's wish to hear a piece of "In Summer I Fall" from The Family Stand's album Chain (1990). Her impromptu a cappella rendition yielded to the evening's finale, "Coming Around". Written with producer Mark de Clive-Lowe, the song also closes Oya's Daughter, taking the listener on one last four-minute tour through St. Victor's heart. On both the album and in concert, it's effectively sequenced. Though the first 60 seconds suggested something laid back and contemplative, the notion was dispelled halfway through when the melody shifted, the tempo accelerated slightly, and Machado's guitar kindled the song's burgeoning intensity. St. Victor rode the ebb and flow of rhythm with ease. Earlier in the show, Faybiene Miranda described Oya as "the agency of change". Under the spotlight at Joe's Pub, singing those final notes of "Coming Around", Sandra St. Victor personified change in all its resplendent glory.